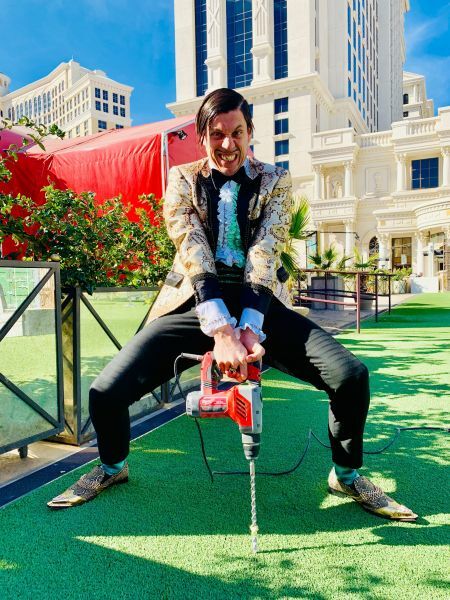 In an emotional ceremony, The Gazillionaire broke the soil just outside his wondrous tent at Caesars Palace - where ABSINTHE performs nightly - to plant Las Vegas’ newest sight to be seen, the ABSINTHE Electric Oak. Expected to grow to full height by Valentine’s Day – just in time for lovers to kiss, propose, or just get drunk under – the ABSINTHE Electric Oak will feature 120,000 LED leaves of ever-changing color and become the spectacular 35-feet high centerpiece of the champagne garden that will take shape this spring, where The Gazillionaire will entertain ticket holders and onlookers alike. The arborous art installation was designed and engineered by Symmetry Labs in San Francisco and commissioned by Spiegelworld. With its towering branches of ever-changing colored leaves, the ABSINTHE Electric Oak is set to create an iconic destination for visitors from around the globe to gather and celebrate. Follow the tree’s growth and The Gazillionaire’s continued antics on Instagram at @GazillionaireLV and share your experiences beneath the Absinthe Electric Oak using #AbsintheElectricOak and #VegasHitShow. Proclaimed “The #1 Greatest Show in Las Vegas History” by Las Vegas Weekly, and named “Best Show” by Vegas SEVEN, the Las Vegas Review-Journal and more, ABSINTHE at Caesars Palace is an adults-only circus variety show featuring a cocktail of wild and outlandish acts in a theatre-in-the-round presentation. Audiences are treated to a night of imagination and excess, as the cast of eccentrics perform amazing feats of strength, balance, danger and unfathomable flexibility within mere feet of the audience surrounding the intimate stage. For tickets and more information, visit Spiegelworld.com and connect with The Gazillionaire and his show on social media - @AbsintheVegas on Facebook, and @GazillionaireLV on Instagram and Twitter. ABSINTHE performs two shows a night every night of the year at 8 p.m. and 10 p.m. For tickets and more information, visit Spiegelworld.com.